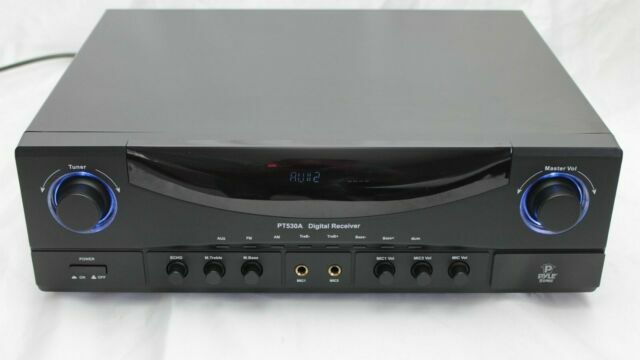 Suitable for audiophiles, the Pyle PRO PT530A two-channel receiver lets you to enjoy your favorite movies and music tracks in outstanding audio quality. Featuring built-in AM/FM tuner with 12 station presets, this Pyle PRO receiver allows you to listen all your favorite radio channels. Moreover, the Vacuum Florescent Display (VFD) screen of this two-channel receiver delivers bright and crisp text, so you can easily view and configure its operation. The over current, short circuit and over voltage protection in the Pyle PRO PT530A receiver ensures longtime working reliability. What’s more, you can easily control the operation of this Pyle PRO receiver with the included remote control. Have had the best, Yamaha, Denon, etc. Didn't want to spend alot of money due to the environment of my shed/ man cave, however had to have GOOD sound and plenty of it. for the price, this unit supplies all my needs, input is a PC, XM, etc, 2 dual 3 ways and a subwoofer on the PC. You won't be disappointed. i bought a stereo system at a pawn shop, it was missed matched, killer 3 way speakers , book shelf receiver, ordered the pyle 350 watt receiver i get channels i did not get before, and the sound is peferct, my shop rocks!! !